This is about the smallest version we could make of this design with this level of detail, and comes in a little over 1/2" diameter. 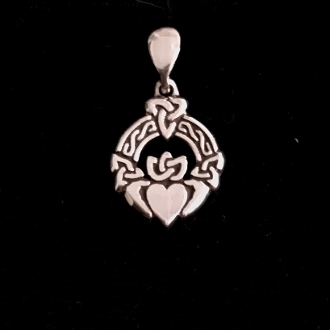 This is a great expression for those who appreciate easy to wear small pendants that still capture the feel of the traditions of Ireland and originality at the same time. See also the larger pendant versions, which are still very wearable in size at under 1" in diameter.